Whittier High School Cardinals quarterback Dylan Salcido runs the ball up against Schurr High School Spartans defenders in the first half during a matchup at Sandy Thorstenson Stadium in Whittier. 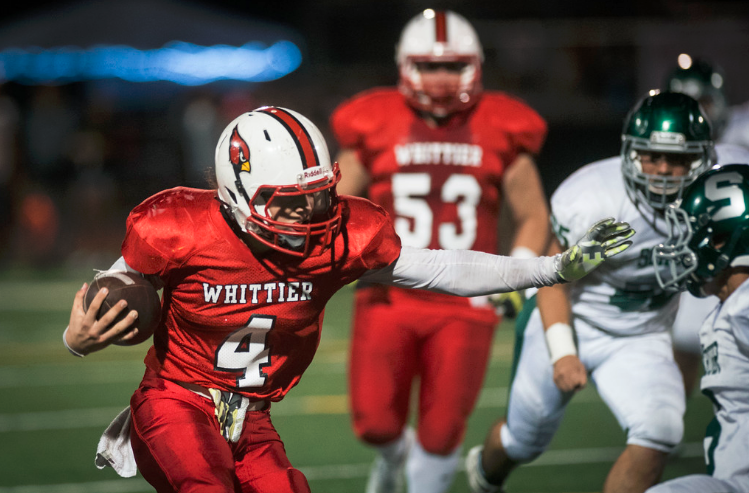 WHITTIER — Whittier High School, after losing its past two games, was hoping for a confidence builder Friday. The Cardinals got a little more. Dylan Salcido accounted for 139 yards and a touchdown and Alex Retana returned an interception 99 yards for another score to lead Whittier to a 27-7 victory over area No. 4 Schurr in a nonleague football game at California High School. Issac Banos and Robert Sandoval also had rushing touchdowns for the area No. 9 Cardinals (3-2). Noah Rangel rushed for 104 yards and a touchdown for Schurr (3-2). Whittier won its third consecutive game in the series. Whittier used two big plays for a 13-0 lead at halftime. The first came in inside its own 5 when Schurr quarterback Miguel Aguero made a misread and was intercepted by Retana, who returned the miscue 99 yards for a 7-0 lead with 8:10 left in the first quarter. The second came on special teams. The Cardinals caught Schurr napping with a fake-punt pass. Retana was again at the center of attention, taking the short snap and tossing to Mark Tolmachoff, who turned it into a 60-yard catch and run to the Schurr 4. Robert Sandoval took it in from there with a run up the middle for a 13-0 lead at 1:40 of the opening quarter. The conversion kick was blocked. Schurr, which gained 265 yards, including 191 in the second half, didn’t go away quietly. The Spartans opened the third quarter with a 65-yard drive and cut it to 13-7 on a Rangel’ 20-yard run at 9:46. Whittier countered with a Salcido 5-yard run to go up 20-7 at 3:48 of the third quarter before Banos clinched it with a 35-yard run for a 27-7 lead with 2:17 left in the fourth quarter. LA MIRADA >> The La Mirada football team played a near flawless game of football on Friday night, shutting out Norwalk 62-0 in Suburban League play. Entering Friday, Norwalk (4-2, 1-1) averaged over 240 yards on the ground per game. But the Lancers were held under 100 against a suffocating La Mirada defense. 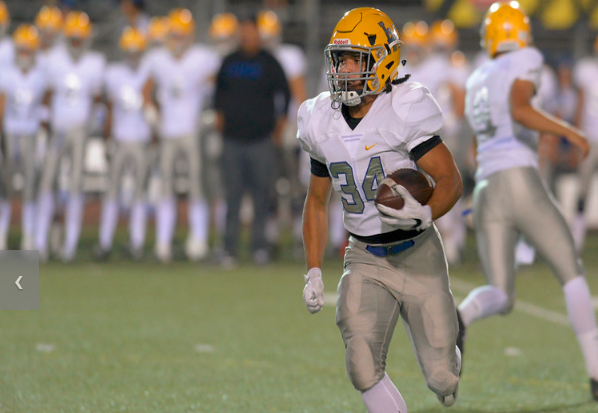 Matadores running back Nick Hernandez scored the first of three touchdowns on the first play of the game, a 52-yard run on the first play of the game. After a Matador interception on Norwalk’s third play of scrimmage, La Mirada quarterback Tristan Meyer threw a beautiful deep pass to tight end Andrew Anderson for another touchdown and a 14-0 lead less than 2 minutes into the game. All-purpose stud Elijah Hicks returned a Lancer punt 96 yards for another touchdown, going untouched on his run to the end zone for a 21-0 lead. WHITTIER — San Dimas High School was pushed for the first time this football season Thursday. But the Saints showed that when challenged, they can push back. 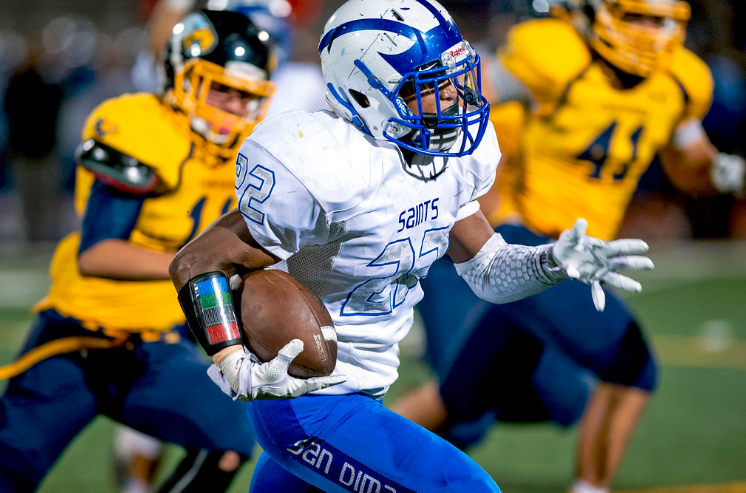 Jarell Sykes rushed for 141 yards and three touchdowns and San Dimas closed the nonleague portion of its schedule with a 41-14 victory over host California. Joey Tamayo also threw for 81 yards and two scores for the Saints, who improved to 5-0. Christopher Lowden rushed for 114 yards and Andrew Reyes had 87 and two touchdowns for the Condors, who slipped to 3-2. San Dimas outgained Cal, 278-62 during the second half to finish with an advantage of 404-273. San Dimas, which was held without a first down on its first two possessions, took control of the game during the middle of the second quarter and scored on five consecutive possessions to lead, 35-14, by the first play of the fourth quarter. The Saints started the third quarter with scoring drives of 65, 55 and 40 yards to go up, 35-14, on a 20-yard run by Sykes with 11:52 to play. San Dimas also got an 8-yard run from Sykes at 7:44 and a 30-yard pass from Tamayo to Daniel Jackson at 5:08 for a 28-14 lead in the third quarter. Santa Fe 3, California 2 — Paris Rivera had 17 kills and two aces and Arianna Gomez had 12 kills and six blocks for the Condors (5-3, 0-2) in a Del Rio League loss. Alliana Loera had 43 assists, eight digs and four aces, Leanne Ruiz had 11 kills and eight digs and Summer Gonzales had seven kills for California. Whittier Christian High School will complete is nonleague schedule Friday night by traveling to South Orange County to face small school power St. Margaret’s in San Juan Capistrano at 7 p.m. 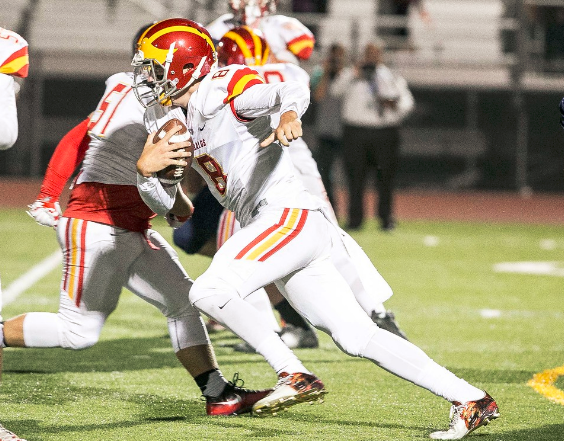 There will be a lot more on the line for the Heralds (4-1) than the winner of a football game. Whittier Christian is one of several football programs in Southern California who are taking part in the MaxPreps and PLEDGE IT “Touchdowns Against Cancer” fundraiser, which will provide needed money for cancer research to the St. Jude Children’s Research Hospital. Those wishing to contribute can do so on the internet at https://pledgeit.org/tac16-whittier-christian-heralds-la-habra-ca. It’s a campaign that hits close to home for the Heralds. Their classmate Abbey Schemmer succumbed to cancer this past summer, just a few months from beginning her senior year at Whittier Christian. Schemmer’s brothers, Ryan and Kenny, played for the Heralds in recent seasons. The fundraiser campaign has been a big winner at Whittier Christian, which has by far raised the most funds among Southern California schools. The Heralds, who have scored 18 touchdowns during the past two games, have raised $9,843 at last count, which leads Southern California. Highland is second at $869. Other local schools in the program are Pioneer, Bonita and Azusa. “It’s really personal for us,” Gradilla said. “With the two brothers and getting to know the family really well and getting to know Abbey and she how she fought the cancer and how tough she was, so when she passed, it was really personal for us. That pride is felt throughout the school and community. “Abbey died last summer and her brothers were big parts of our football program,” Whittier Christian athletics director Rolland Esslinger said. “It kind of resonated very strong on our campus and our football community. It’s great to see how everybody has gotten behind it. Pioneer 3, California 1 — Leanne Ruiz had 10 kills and eight digs and Allianna Loera had 24 assists and nine digs for the Condors (5-2, 0-2) in a 25-21, 23-25, 25-20, 25-7 Del Rio League loss. Arianna Gomez had six kills and six blocks for California. Whittier 9, Santa Fe 9 (77-75) — The team of Murisa Brumfield and Raquel Castillo swept in doubles for the Cardinals (10-2, 2-0) in a Del Rio League match.